Here's the ultimate artbook companion to the Arkham games and it's well worth the wait. This hardcover book comes in at 304 pages. It's big and heavy. 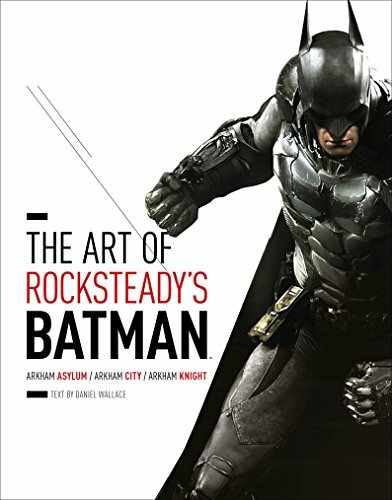 The book covers all the three Arkham games namely Arkham Asylum, Arkham City, and Arkham Knight. When I first played Arkham Asylum, I was taken in by the details of the design of the environment and the overall mood. It felt really immersive. Now we have an artbook that goes behind the scenes to show you what it took to create the games. There are over hundreds of artworks, the concept art that comes in form of sketches, character designs, digital paintings, environment layouts and 3D stills from the game. The artworks are reproduced big and look great. There are things like 3D renders of Arkham Asylum, paintings of streets in Arkham City, props and many more. I like the art direction for the game. It visually departs from the usual comic style art associated with DC comics. Somehow, the game just makes the world feels more real, just like how the games also let you experience what it's like to be running around in the Arkham universe, or as they call it the Arkhamverse in the book. There's quite a good amount of commentary and interviews to go with the art. There are creators of the game talking about the design of the game, the characters and the production. There's also a one page writeup on the programming aspect of the game. Overall, it's an insightful read and helps you understand more about the world. There are some downsides. Arkham City's coverage only has 55 pages while the other two games were given over hundreds of pages each. Not all the enemy characters are included. Would have been good even more enemies, even the miscellaneous ones could be shown. Art from Arkham Knight felt restricted even though there are over hundred pages of content because the book's holding back on the spoilers, the bad guys. They only used game stills (three) for Mr Arkham Knight himself and one piece of concept art. And finally some might prefer less game stills and more art. Anyway it's a small proportion of game stills compared to art, just that some of those stills are blown to double pages. It's a good book that should appeal to the fans despite the downsides.